Editor’s note: You may have missed this article when CMI published it last year. We’re sharing it now because promotion of your content – and practical steps to do so – are always needed. Marketers often pour their efforts, resources, and budgets into developing an e-book only to move on once the landing page is live. Your e-book could be the next game-changing, Content Marketing Award-winning, produce-into-a-major-motion-picture piece, but without promotion, nobody will click, download, read, or even see it. Promoting an e-book goes beyond creating a landing page, tweeting a link, and emailing it to your customers. Those are the staple moves, much like serving turkey and dressing at Thanksgiving dinner. 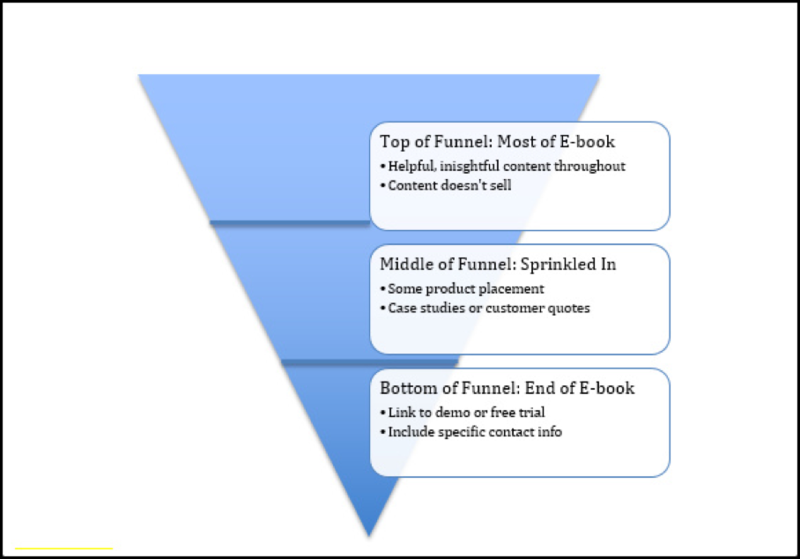 Great e-book promotion touches all phases of the sales funnel and requires involvement from multiple teams within your organization. A collaborative, planned approach to e-book promotion not only generates leads, but it also catches the eyes of your best prospects. Your top-of-funnel efforts likely cast a wide net. You know some information about this audience so you can target accurately, but you don’t know them as well as you know your best customer. Therefore, this is the place to slice and dice your promotion the most. People digest content in different ways. The more you chop it up and share it, the more e-book buzz you’ll create. Turn each chapter into a blog post on your corporate blog. Record someone from your team reading the e-book and launch it as an audio book. Run a webinar with the author, featured thought leaders, or brands. 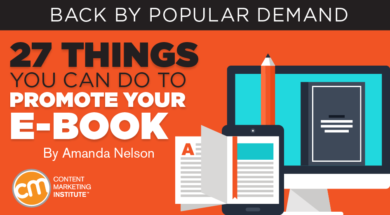 Create an infographic with the e-book’s tips, tricks, or quotes. Tweet with quotes, stats, or tips from the e-book. Host a Twitter chat on the topic. Post snaps and Instagram stories with featured quotes or tips. Contact influencers and ask them to share it (give them an exclusive sneak preview for even more exposure or buzz). Write a guest blog post for sites covering the topic. Include the e-book in two or three places on your website, such as the home page, resources section, customer log-in page, and sidebar callout. Turn it into a printed book and give it away at conferences, booth exhibits, etc. Write email and phone scripts/outlines about your e-book for cold outreach by sales or business development representatives. If you generate a thought leadership, top-of-funnel e-book, you might think your promotion efforts stop at the top of the funnel. That is not the case. Other departments and audiences can benefit from your e-book, which will ultimately lead to revenue for your organization, which should be an end goal for you, too. The middle of the funnel is where you get existing prospects to raise their hand and move closer to the sale. This is probably the toughest part of a marketer’s job. If you have great content and a strong reach, it’s not hard to get net new leads into your database. A simple download is all you need to get the process started. However, to get those leads to commit to a demo or free trial takes more work. Your e-book can help. Work the e-book into your nurture program(s) or drip campaigns. Share on your organization’s forums or community site. Create a content pack for existing prospects, including a case study, e-book, one-sheet, etc. Include the e-book in your newsletters. Ask partners to send it to shared partners and networks. Print it and include it in a care package to customers and prospects. Enter your e-book in marketing contests. Attach the e-book to first-call presentation decks. Use it to develop email or phone scripts and templates for existing prospect outreach. Print it and give it to salespeople as takeaways or leave-behinds for meetings. Don’t get overwhelmed – think of this post as a tapas menu, where you can pick and choose the tactics that work for you. As you promote your e-book, you’ll quickly learn what works (and what doesn’t work). From there, you can hone in and focus on the successful tactics. Soon, you’ll have a well-oiled machine for not only creating great e-books, but also for getting them out there for the world to see and devour. We’re following Amanda’s advice. Check out a wealth of content marketing resources in the Content Marketing Institute e-book library, from The Essentials of a Documented Content Marketing Strategy to Digital Governance: A Primer for Content Marketers. Editor’s note: This back-by-popular demand post has been updated because promotion of your content — and practical steps to do so – are always needed. Amanda Nelson is senior manager of AppExchange content and community at salesforce.com. She has a content marketing and community management background and has worked in account management for interactive and full service advertising agencies. Follow her on Twitter @amandalnelson.